It’s hard to believe that Nemo is so old. It feels like this movie came out just recently, not twelve years go. I guess that makes the film timeless, though that word is used sparingly when it comes animated movies. Only a few have ever taken that title, mostly Disney films, and they’ll live on forever, reminding us of our childhoods every time we hear their names. With this new crop of Disney/Pixar & other animation studio films, it will be our children we remember when we think back, not our own youth, and that makes this films timeless in a completely different yet still effective way. Nemo, though different from the classic princess or Grimm tales, holds its own as one that we won’t quickly forget. On the coral reef of Australia, there lives a nervous clown fish and his son. Marlin is the world’s most worried dad, having lost him wife & children to a freak accident some time past. Nemo is his only son, an adventurous little guy with one little fin, not the best swimmer but full of confidence. Marlin is overprotective to a fault, and one day he pushes his son too far. Nemo swims out into open water just to show that he can, and becomes captured by a diver. Marlin begins a frantic search for this son, meeting a flighty blue fish named Dory on the way. The pair go on a journey that becomes the thing of legends, all to find a very little fish who is lost in a very big ocean. 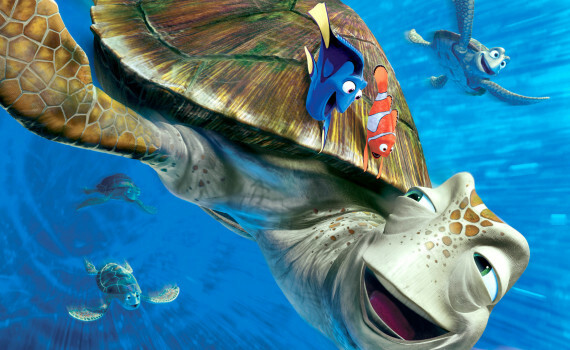 Finding Nemo does something with very little music and background that not many others could pull off. Wall-E comes to mind, a movie that didn’t have to use a classic fairy tale, didn’t need pop songs, and still delivered a major message in a small amount of time. Nemo is that type of movie, a film about the adventure and the feelings driving the characters, a clean tale of love conquering all. Don’t get me wrong, I love a good Disney sing-along, but this film doesn’t need that crutch. The drama and the humor inherent in the plot are enough to carry it through to the end. Ellen is spectacular as Dory, the forgetful heroine, and really alleviates the stress that Marlin puts on the journey. The characters we meet along the way are all excellent as well; Mr. Ray the teacher, the tubular turtles, the Tank Gang, the pelicans & seagulls. It’s a great sea creature ensemble and a great movie, one that doesn’t need a lot of tricks to stick with you and to pop up in your mind years later as a film worth watching again.